COLORADO and TEXAS - GREAT HUNTS! I work with an outfitter that has always had tremendous success. He specializes in giant mule deer and affordable antelope hunts. Either gun or bow, this can be a great hunt. His Colorado operation encompasses over 40,000 acres between 24 different private ranches ranging in size from 400-6000 acres spread out over a large area allows you to hunt several types of terrain as the animals move for weather and feed. You can expect small camps of 4-6 hunters per week which allows our guides to tailor the hunt around the needs and desires of the hunter. With so much land to choose from you have the luxury of not having to over hunt any one ranch. His success rates over the years have been very good. Our rifle deer hunters have had over 95% success with our archery deer hunters having somewhat lower success of 50% over the past 5 years. You are invited to the “Eastern Plains” of Colorado for the quality private land hunt you’ve been dreaming of. Fair chase hunts for Elk, Deer and Pronghorn Antelope on some of the best lands available, anywhere. The genetics and age class of our herds are excellent, giving you an opportunity to harvest a true trophy-class animal. 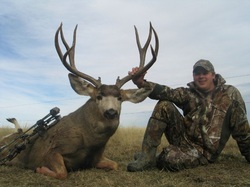 We target Mule deer bucks scoring over 175”, bull elk over 275”, and Pronghorn bucks 13” to 14” plus. We have more than 40,000 acres of quality private ranch land leased for exclusive hunting. Our guides are trained and passionate about making your hunting experience unforgettable. His newly acquired Texas operation consists of a 50,000+ acre ranch in north/west Texas that offers hunters a chance at a free range whitetail or mule deer, Rio Grande Turkey, or any of the varmints running around on the ranch. Aoudad/Barbary sheep, wild hogs and once again varmints provide as the opportunity to extend our season when all else is over. It doesn’t matter if you use a bow, muzzleloader or rifle, we will give you 100% effort and attention every time. Just remember, we are a small volume outfitter so don’t delay in booking your hunt. We're also very concerned about conserving this wonderful resource for generations to come. Outfitting allows us to closely monitor and manage the health of our herds. We won't over-hunt our ranches and we're adamant that only the oldest, most mature animals are harvested.